This was the monster fish tiny Richard Ricketts landed after a 10-minute battle with the beast. The 10-year-old landed the 21lbs creature while out fly fishing with his dad. At 35ins long, the rainbow trout is almost as tall as 4ft 10in Richard – and it weighs a third of the lad’s 5st. Richard said: “I cast my line out and I left it out for about 10 seconds to float and it took the fly and jumped out the water. “Then it came to the surface and my dad said it was a 20-pounder and I got really excited. “I said, ‘Oh my God!’ It was like, really big. His schoolmates didn’t believe he had caught the beast until they saw his snaps – and fishermen six times his age wished they had caught it. “Some were green with envy,” mum Helen Ricketts said after dad Dai had caught the catch on film. But Dai can be heard on the film advising him to “just take your time”. Dai was still amazed by the catch this week. “Richie has been fishing for a few years but he has only been fly-fishing for two,” the 44-year-old dad-of-two said. Richard caught the fish in Llyn Clywedog, near Llanidloes. He was taking part in a Llanilar Club competition. “They only stock up on fish between 1-3lbs,” Dai said. “But this was a grown-up fish, it had been there a long time. “I wouldn’t like to say how old it was, but it would be a few years old. Dai dubbed the trout “the fish of a lifetime”. “He has achieved it aged 10,” he said. Straight away, Richard called his mum at their home in Llanfarian, near Aberystwyth. 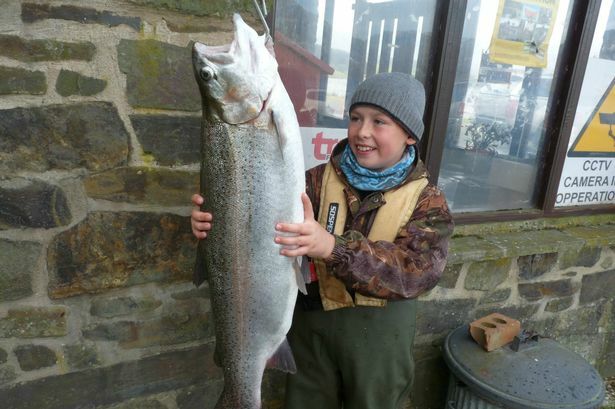 “You’re not going to believe it, I’ve just caught a 21-pounder!” he told his mum. “She was flabbergasted,” said Dai. Richard started fishing with his dad when he was six. “I’m a bit of a fisherman myself,” Dai said. Richard is now trying to qualify for the Welsh youth fly fishing team. He has had one trial and has another one in July. “It’s not something you hear about catching every day in a large water reservoir,” Dai said. “You hear about it in smaller reservoirs – down in the south of England they grow the fish to a large size to get customers to go fishing.